VREF Consultants Limited – Simplicity. Agility. I’ve been doing a lot of thinking about leadership recently. I sometimes come across teams, especially “management” teams, who are not really teams at all. They just happen to be on the same line of an org chart with a common boss. Unsurprisingly, they do not make any effort to effectively communicate, let alone collaborate, and the results are not pretty. Their own teams in turn do not communicate or collaborate effectively, leading to a fractured, dysfunctional organisation. It results in an indefinable, but unhappy atmosphere, with people feeling disconnected, focusing on tiny tactical wins, and being demotivated by a lack of significant progress. It is often accompanied by a focus on demonstrating busyness over effectiveness. Where do you start to turn around this unhappy ship? At the top. A common definition of a team is “a group of people with a common purpose”. It is the leader’s absolute responsibility to define and explain that common purpose to their management team. It is possibly the most important aspect of leadership. Achieving collective goals directly related to that common purpose should be the measure of each team member’s success, and the leader must tell people that this is one of the critical factors upon which they will be assessed. Without it, people will pursue personal agendas, hoard information, focus on creating and protecting their empires and will prioritise all of those things over delivering value through their own teams. If you have been promoted to any level where you have a team of your own, you must accept that you must be a leader. Any leader has a position of great responsibility. There is no abdication of that responsibility. As soon as you have a team, your primary focus must be to become and remain the best leader you can possibly be to your team. I don’t care if your job title says “Manager” or “Head of” or “CXX” – if you have a team, you are now a leader. Act like one. If you can’t do this, you are not the right person in the role. A very strong statement, I know, but true. You will just feel stressed and unhappy, and life is too short for that. Finally, you owe it to those people who need an effective leader in order to fulfill their own potential. If you can’t be that effective leader, step aside. Leadership is not for everyone. Postscript: I work with lots of leaders in helping them to develop the skills and attributes I’ve outlined above. This short post just starts to explore what is a very deep and fascinating subject. If you want to arrange some time with me, in the strictest confidence, to discuss your personal situation, please contact me. When I ask people about the key characteristics of great teams, one word is used above all others – trust. It has certainly been my experience that all of the best teams I have been a part of have composed of people who trusted each other. It’s such a fundamental tenet of teamwork that I honestly don’t believe any group can become a team without it. I have been a member of teams where that level of trust has become so strong, and that team bond so enduring, that many years later I know that I can ask for the help of my fellow team mates and to the best of their ability, they will provide it, no matter how far away they are, or how long it may have been since we last met. To build that bond, it’s often that case that we have shared adversity together, and have a collective memory of support, collaboration and individual effort for the team’s welfare. In most cases, we never explicitly discussed those things – they are just part of what we each took away from the experience. We saw people do the right thing for the team in difficult circumstances. We also shared the pride and happiness when things went well. In a few cases, we experienced great sadness together. So over time, people working together can build trust, sometimes to extraordinary levels. But how does a group of people start to build trust when they are brought together as a team for the first time? I think it starts with the little things. Here are some examples. If a team is supposed to meet at a given time, people don’t turn up late. People are open and honest with each other. This can take time to build, as it is in itself a manifestation of trust. You do what you say you will do, and if you can’t, you will let people know why you couldn’t. You look for opportunities to help others. A team inception event is often useful in starting to develop routes to build trust in a new team. Discussions and exercises can establish common ground, identify shared values and allow team members to learn a little of the personal backgrounds, interests and the human elements of their colleagues. This can all help to start creating an element of unity across the team. Humour has a very important part to play too. When people smile and laugh together, they relax and can collaborate and communicate together more readily. It is a leader’s responsibility to describe that common purpose so that all of the team understands it, can see the value in it, and recognise their individual role within the team to help achieve it. Without this, it is unrealistic to expect people to work together in concert to realise any shared goal. If you want your people to see you as a leader, they need to trust you. They need to see you exhibit the behaviours and attitudes that you expect of them. They need to see you supporting them. They need to see you step up and get involved when the team needs help. They need you to thank them when things go well. Sometimes, people need to be able to trust those they do not know. A passenger on an aircraft absolutely needs to trust the pilots that are controlling the aircraft. The pilots need to trust many people who have prepared the aircraft for the flight, from the engineers who service the aircraft, the refuellers who need to ensure that enough fuel of the right type and quality has been uplifted, and the other staff who ensure that things like the route and loading has been carried out correctly. Why do people trust third parties in this way? Partly it is because they believe that those third parties understand the consequences of not doing their best, and have a responsible attitude to their work. If you are responsible for something, in most cases, other people are relying on you to satisfactorily perform or complete a task. Not just correctly, correctly and promptly. When people don’t understand their real responsibilities, or the responsibilities they have been provided do not match the expectations of those who rely on them, they will fail to meet the expectations of those who rely on them, and trust will erode. Many people I see in organisations do not understand the consequences of their actions or inactions. That is not their fault. It is the responsibility of those who lead them to help them understand. So they will let people down, often without even realising it, if there are no good lines of communication and collaboration with those who rely on them. This often happens when a team relies on another team, especially when there is physical separation between teams. If two teams sit next to each other, there will be some ad hoc, unstructured communication, even when there has been no mandate or structure explained by the teams’ leaders. If they are 100m away, that ad hoc communication probably won’t happen. If they are 100km away, it definitely won’t happen. So leaders need to help interdependent teams to collaborate in much the same way that individuals within the same team do, albeit less frequently. To summarise, if you want to be in a great team or want to lead great teams, take time to think about what you as an individual can do to build and maintain trust within the team. Then continually look for opportunities to demonstrate your trust in people, and to get them to build their trust in you. As a coach, I definitely don’t want to apply cookie cutter recipes to the teams I work with. But feedback loops and metrics are at the heart of agility. Values, principles and practices need to be explained, supported and encouraged. The coach and the team need a shared vision of what good looks like. 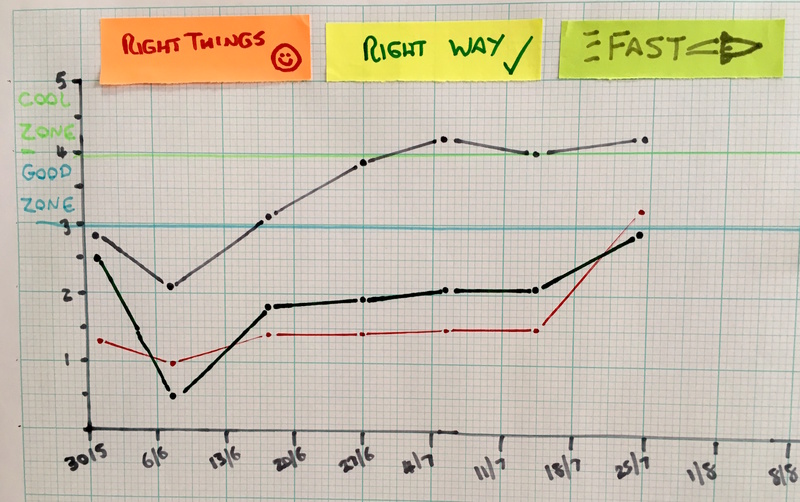 One approach I’ve been using at my current client is to establish and maintain a tracker, which looks at 21 different elements related to delivering the right things, delivering things the right way and delivering value fast. I use a simple scale of 0-5 for each element, with 0 meaning no evidence, through to 5, meaning this is good enough to use as an example with other teams learning to work in this way. As I observe behaviours, and work with the teams, I make a regular assessment of each element and score the team accordingly. The team and I discuss the scores, and this is a useful framework for explaining not just what we do, but also why we do things. 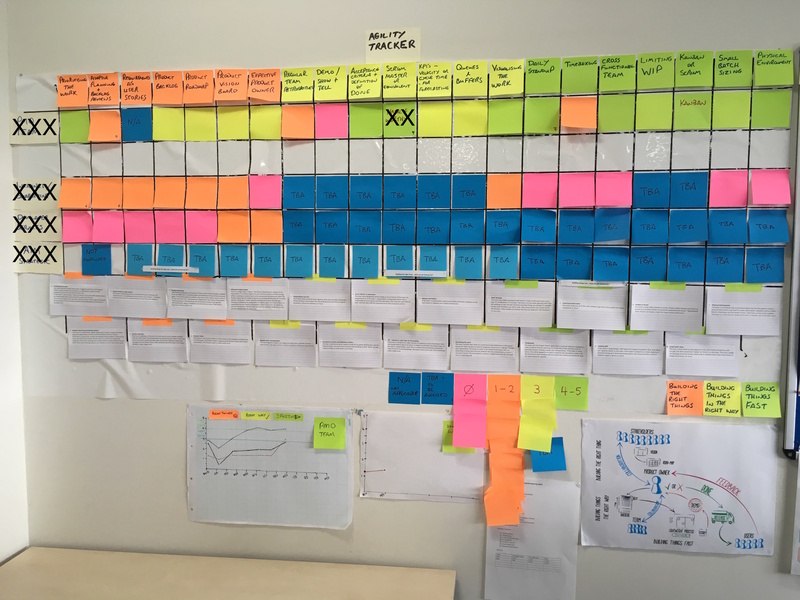 We visualise the current status of each element on a Big Visible Chart (an Information Radiator) using different coloured post-it notes. Green for example, indicates a 4 or 5. Pink indicates 0, Orange is a 1 or 2 and yellow indicates a 3. Every element has a corresponding index card with a brief explanation of what “good” looks like. A description of one of the 21 elements. 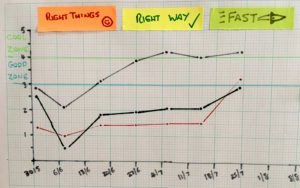 I create a graph for each team showing trends of the aggregates of the three groups of seven elements (Right thing, Right Way and Fast). 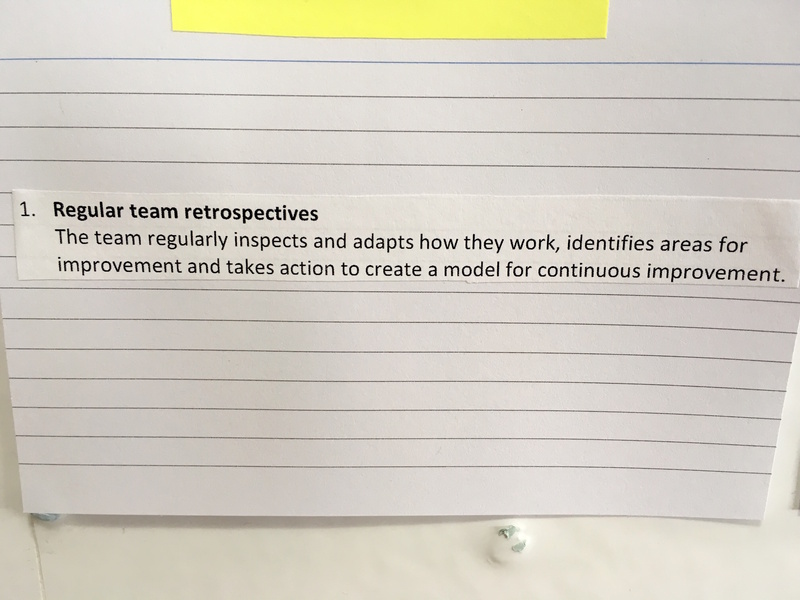 The teams I’ve used it with really like it, and senior stakeholders also like the big picture it provides of increasingly good practice. 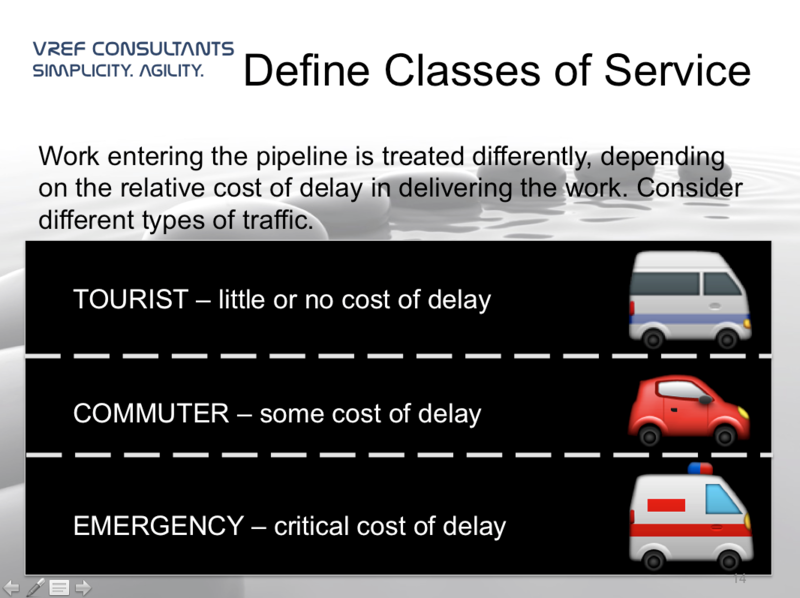 This is from my current session on Kanban fundamentals, to explain how we prioritise different types of work, based on the relative cost of delay. 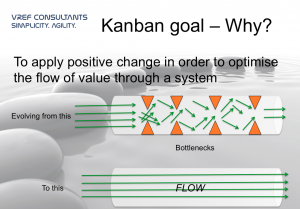 We agree classes of service with our customers, make the ground rules (Policies) clear and explicit, and use them to manage the flow of work through the Kanban system. 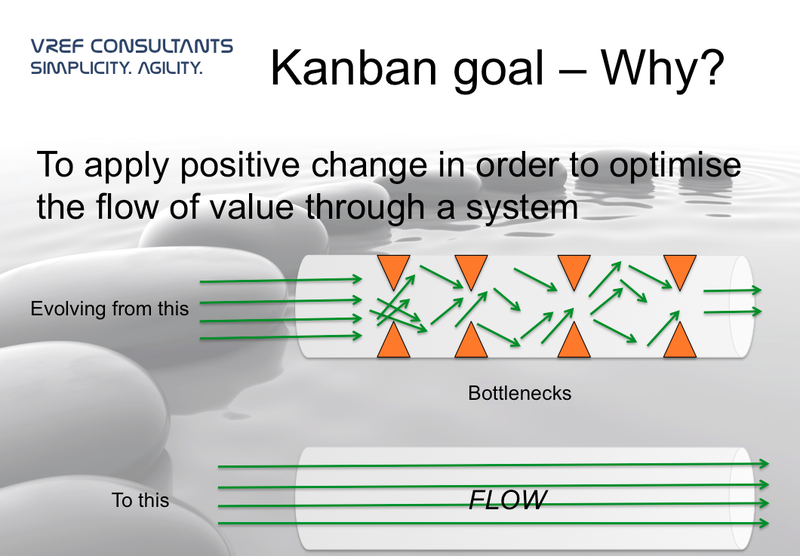 We also periodically review the classes of service with our customers as clarity emerges from the Kanban system itself. If you’ll only take one piece of advice from me, this is it. 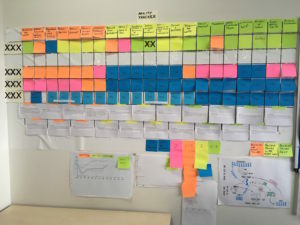 If you can only adopt one agile behaviour, adopt the retrospective. Any team or individual can do it. Gather data, generate insights, decide what to do. Be realistic. You can’t change the World in one go. But pick a couple of things you really can change immediately, and make the change right now. Then, in a couple of weeks, repeat the exercise. Keep repeating it, again and again, forever. Don’t expect miracles or dramatic change. But if you follow this advice, over time you will become more effective than you ever imagined possible. The only way that this will fail is if you stop. I honestly believe that’s the best advice I can can give to any person, team or company, based on what I’ve learned since I left school at the age of 16. I’ve worked for a living ever since, and I wish I’d learned this very simple lesson much earlier. I’m super busy working with a client at the moment, but I do want to keep providing small slices of value to this site on a frequent basis (see what I did there?) – so here’s one slide from some of my coaching materials. 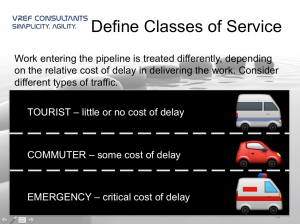 This is from a session I call “Workstream fundamentals” which is framework agnostic. Remember, if Agile delivery sounds or looks complicated, with complex diagrams you couldn’t draw by hand in a few minutes, something is wrong. 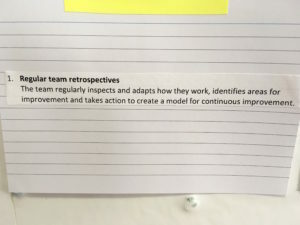 I’d just started coaching a new client organisation and the very first team I was working with were taking their initial steps in Lean/Kanban. 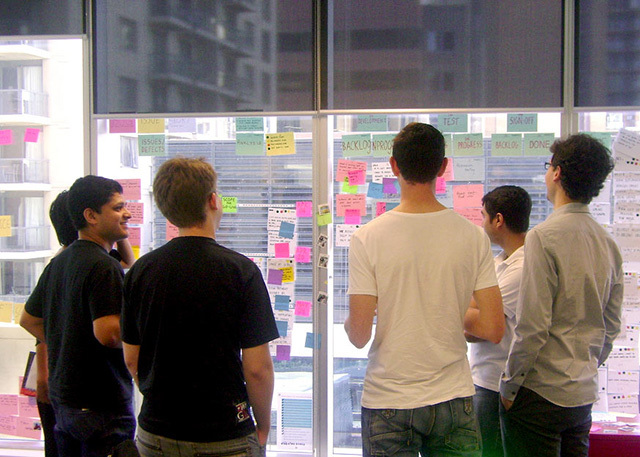 They were starting to visualise the work, an embryonic backlog was emerging, and they’d had their first standups. 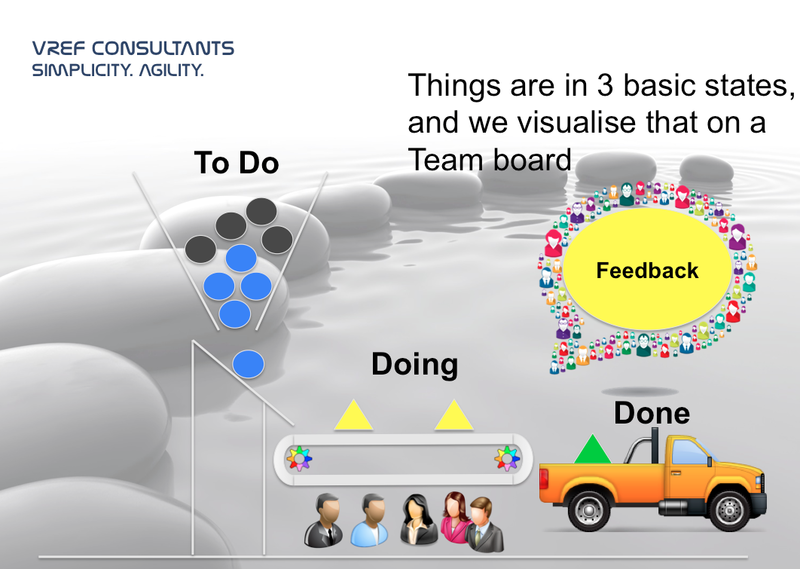 We talked about visualising blockers and impediments on the team board, in order to ensure all the team members knew about them and could offer help to resolve them. One impediment that was evident after just a couple of days was that there was no simple way of creating a collaboration space for sharing documents across the team. Those documents formed an important piece of research within this team’s remit. The reason was that some team members were consultants from an outside supplier, and they didn’t have access to the corporate network. It was already causing delay, waste and duplication of effort to multiple individuals. Yet the team didn’t consider getting that impediment up on the team board. Why? Probably because “that’s just how things are here” and because it wasn’t something the team could resolve themselves, and the impression was that it just couldn’t be solved. Maybe that was true right then for the team. Yet this impediment will create delay, waste and duplication of effort in any project or piece of work that involves external suppliers collaborating effectively with staff. 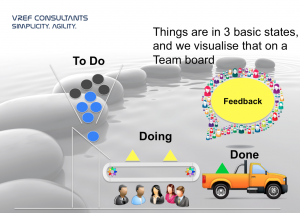 Jumping forward into the future, if the same impediment appears on many team boards, therefore appears on Programme boards, and percolates up to be visible on the portfolio board that is used by the Senior Leaders in the company, the true impact of this issue becomes transparent and impossible to ignore. Resolving it will improve flow across many areas of the business. But until those little impediment markers start appearing on team boards, it will always be “just how things are here”.